Does your kitchen need a design update? Maybe you’re bored by the look of your plain cabinet doors, or maybe you want to brighten up the kitchen with a lighter color of wood or paint. Remember: you don’t have to buy all new custom cabinets to change the look of your kitchen. 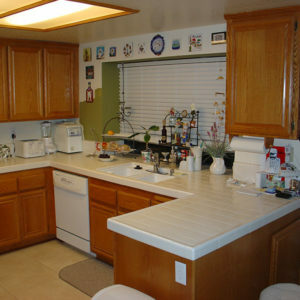 All you need to do is get cabinet refacing in Lake Forest CA from Cabinet Magic. What Is Cabinet Refacing in Lake Forest CA? With cabinet refacing in Lake Forest CA, most of your cabinetry will be left in place and reused. We will only replace the doors and drawer fronts. Adding or replacing crown molding is optional. Any other exposed cabinet surfaces, such as the outsides of corner or end cabinets, will also be updated. We typically cover these surfaces with a matching material so they look just like your new doors and drawer fronts. Cabinet Magic is a respected manufacturer of custom cabinets, and we put the same craftsmanship into our new doors and drawer fronts. We will make them to your exact specifications. We offer an extensive choice of cabinet styles and colors. When cabinet refacing in Lake Forest CA is paired with new features like soft close hinges, lazy susans, and pull-out racks for deep cabinets, the result is cabinetry that looks and functions like new. At Cabinet Magic, we have a professional team standing by ready and willing to start helping you with your cabinet refacing in Lake Forest CA. Get ready to join our long list of satisfied customers who have experienced our superior service and craftsmanship firsthand. For a free in home estimate on cabinet refacing, please contact us at 800-828-4380 contact us at 800-828-4380. We’ll be happy to schedule a visit from one of our design specialists.